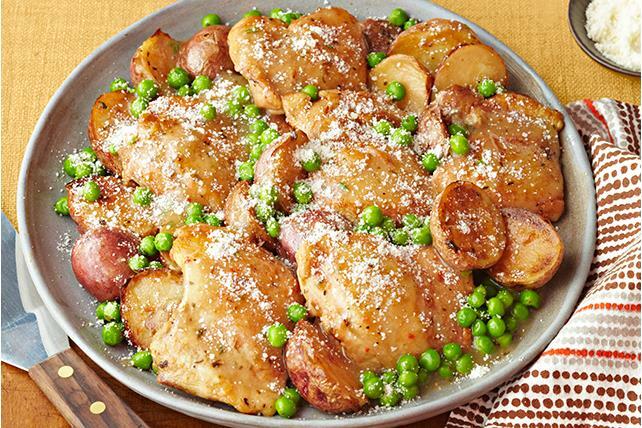 Traditional Tuscan herbs and spices elevate this potato and chicken thighs skillet to new heights. The flavorful sauce doesn't hurt either. Heat 1 Tbsp. oil in large nonstick skillet on medium-high heat. Add chicken; cook 3 min. on each side or until thighs are evenly browned on both sides. Transfer to plate; cover to keep warm. Add remaining oil and potatoes, cut sides down, to skillet; cook on medium heat 7 min. on each side or until potatoes are golden brown, stirring in garlic, rosemary and oregano for the last minute. Add broth and dressing; stir to scrape browned bits from bottom of skillet. Bring to boil; cover. Simmer on medium-low heat 10 min., stirring occasionally. Return chicken to skillet; simmer 5 min. or until potatoes are tender and chicken is done (165°F). Transfer chicken and potatoes to platter with slotted spoon, reserving liquid in skillet; cover chicken and potatoes to keep warm. Bring liquid in skillet to boil on medium-high heat; cook 5 to 7 min. or until reduced to about 3/4 cup. Stir in peas; cook 1 min. or until heated through, stirring occasionally. Spoon over chicken and potatoes; sprinkle with cheese. Decrease broth to 3/4 cup and add 1/2 cup dry white wine, if desired. Please use alcohol responsibly. When cooking chicken, use tongs instead of a fork when turning the chicken over. This will help to prevent the juices from running out, resulting in a moister, more flavorful cooked product. Substitute 1 pkg. (16 oz.) frozen potato and four-cheese blend pierogies for the potatoes. Cook in skillet on medium-high heat 2 min. on each side or until evenly browned on both sides. Continue as directed, reducing the 10-min. simmering time to 5 min.